Garlic Noodles recipe from Burma Superstar Cookbook is addictive! Garlic Noodles recipe from Burma Superstar Cookbook is addictive! This recipe is slightly adapted from the Burma Superstar Cookbook by Desmod Tan and Kate Leahy. In a small saucepan over medium-high heat, heat the oil. Add 3 tablespoons of the garlic and cook, stirring, until the garlic just begins to turn golden brown. Remove from the heat as soon as it begins to change color because the garlic will continue to brown in the hot oil. Transfer to a large, heat-safe serving bowl. Add the sliced red onion and soy sauce to the bowl with the garlic and oil. In a separate small serving bowl, combine the sriracha, the remaining tablespoon of garlic, the ginger, sugar, salt, and water and stir to mix well. Cook the noodles in boiling water according to the package directions. 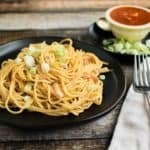 Drain the noodles and then immediately add them to the bowl with the garlic, oil, onions, and soy sauce and mix until the noodles are well coated with the oil and the onions are mixed in. Serve the noodles garnished with scallions and pass the sriracha mixture at the table for diners to add to taste.